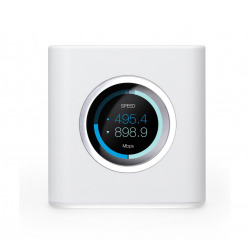 Standalone router which is part of AmpliFi system is usable when you need to cover smaller space but you are interested in elegant, modern design and capability of extension in future and moreover high wireless performance. Thanks to its design this router might not be hidden in the corner - fits perfectly to modern living rooms. AFi-R has multi-functional LCD display on the front side and 4x LAN 10/100/1000Mbps, 1x WAN 10/100/1000Mbps and 1 USB port on the back side. For wireless connection the latest 3X3 MIMO 802.11ac technology is available with modulation speeds up to 450 Mbps (2.4GHz) and up to 1300Mbps (5GHz). You can set-up and manage your router via mobile application - available for iOS and Android.